Ever wondered if you can change the blogspot domain in your blog ? The answer is Yes you can. Suppose you have a domain name myblog.blogspot.com and you wish to change its domain to techguide.blogspot.com then what would you do ? Download template and posts and upload in a newly created blog updates the widgets and hell lot of things. The answer is NO. You can simply change the URL of your blog. Below is the step by step guide to show you how you can change the blogspot domain name in your blogger blog. In the Basic Tab (Open by Default) you would see three categories Basic, Publishing and Permissions. Under the Publishing settings click the Edit text which will be be beside your blog URL. Enter your new desired domain and click save. You will see a confirmation popup showing that your desired settings has been saved. Now you can see your blog on a fully new URL. 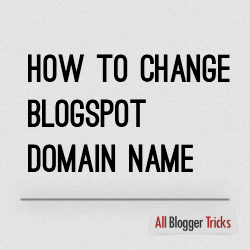 This setting can be useful for those who want to change their blogger domain name. Blogs with personal names decrease it value in such cases this can be the best solution. Thanks, it was a great help !!! they will not take money ???? This was a great help for me! My new domain entire posts url are index Best coursework writing service UK . Hello Friends, here we offer you amazing Tata Cliq Discounts use them and grab latest new offers. The concept, Changing a domain name of your blog spot is very new to me. I am just surfing and got stuck here at this article. I also maintain a blogspot but never thought that I can change the domain name as I want. It's very useful info for the people who have a change of thought about their domain name. I should mention "Dhiraj Barnwal" is doing a great work through this blog and it's a good guide for the newcomers for this blogging. I surely try to change my blogspot name today. as we all discussing domains, I would like to tell one of my past domain buying experience with Big rocks. I did not have any knowledge on domain buying at that time and I just discussed the same with my friend. She suggested me to check GoDaddy and big rocks. I checked both the sites where I got to know domain registration sites also provide coupons to give a discount to the users at the checkout page. The next question in my mind is where would I get the coupon now?. Then I started surfing again and I got some coupon sites like Couponzeta, Coupondunia, Couponraja and much more. I checked all the sites and finally, I got a reasonable offer in Couponzeta site. I found Couponzeta very useful, not for the reason it has coupons apart of that Couponzeta maintains it's standard mark by providing the latest and active coupons to its users. I checked for Moglix Coupons in http://www.couponzeta.in site. I got them and applied the coupon code there and bought my own domain. Finally, I learn a lot through the journey of getting my own domain, I personally suggest you all have a look on Couponzeta for the best avail offers. Thank you for the lovely post i learned alot and now i am able to Zoomcar offers Change thanks for teach me .